The history behind the castle - The town of Fuengirola has its origins in Phoenician, Roman and Arab civilisations. The inscription on the pedestal of a statue found near the castle mentions Suel as being a Roman "municipium". A funeral urn found in the same area has an inscription containing the word "Suelitana". Roman baths were discovered in 1961 and, close by, the remains of a Roman villa containing two sculptures, one of which is the well known "Venus of Fuengirola" exhibited in the town's museum. A series of architectural components, probably transported from the Mijas quarry during the Roman era, were discovered in Los Boliches in 1984; these have now been mounted to form a temple entrance, and can be seen on the promenade at Los Boliches. 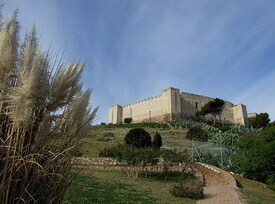 The castle was built by Abderramán III in the mid-10th century. The city of Suel ceased to be mentioned at the beginning of the Middle Ages. After several centuries, the name of the settlement changed from Suel to Suhayl, which became the name of the castle and surroundings during the Arab occupation. Suhayl became a fairly large settlement, which included farmland and small villages. Most of the area seems to have been used as pasture for the Moorish rulers' camels. But in the early Middle Ages the town was set on fire and its inhabitants fled to Mijas. Suhayl became a mound of ruins, and even its name was changed to the Romanised Font-Jirola, after the spring arising at the foot of the castle, according to historian Alonso de Palencia. In 1485, when only the fortress remained, the settlement was reconquered by the Christian Monarchs. An attempt to repopulate the site with 30 people failed, and in 1511 it was registered as uninhabited, apart from the fortress and a watchtower. Land originally set aside for Fuengirola was reallocated to Mijas. In the 17th century, a new urban settlement developed, once the threat from Turkish and Moroccan pirates disappeared, and at the beginning of the 18th century, an inn was opened near the beach, offering accommodation to travellers, muleteers and seafarers. A few huts were built nearby, forming a small village. The Battle of Fuengirola took place in the area during the Peninsular War, on October 15, 1810, when approximately 200 Polish soldiers of the Duchy of Warsaw defeated a mixed British-Spanish force numbering some 3,000 soldiers under Lord Blayney. In May 1841, Fuengirola was detached from Mijas; at the time its inhabitants were mainly engaged in fishing, agriculture and trading with ships that dropped anchor in the bay. For over a century, fishing and agriculture remained the main activities. It was only in the 1960s that Fuengirola entered a new phase, to become a leading tourist centre. Please note these photos are copyright of All Spain Accommodation.